The story of Digitek begins at the Mys-Tech organization. Kether Troop, a team of Mys-Tech mercenaries tasked with recovering alien technology from alternate dimensions, manage to retrieve a product called Protosilicon from an unknown source and installs it on an item known as Jump 61. Technological analysis of the item followed, and Jonathan Byrant is assigned as its Project Leader. His supervisor, Mr. Grant, sabotages the project with a computer virus, but Jonathan somehow gains a vision of this. He rushes back to the facility. He arrives just as the building explodes, and is believed to have been killed. Unknown to all he survives and finds that the suit has bonded with him. 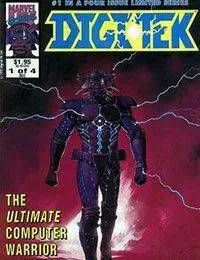 Choosing to use his powers for good, Jonathan decides to call himself after the project: Digitek. His first opponents are the villains known as Bacillicons, three mercenaries who had been similarly transformed, but are warped by the virus.